I've been a huge fan of Daniel Wellington's brand since I first saw them on Instagram. I'd always wanted a watch, but the white face just didn't fit with my wardrobe. Quite recently, they launched the Classic Black collection, which is an extension of their flagship Classic Collection. All black watch in a minimalist style? I had to get my hands on one. The watch I chose was the Classic Black Sheffield in silver. Black leather band, silver hardware, and black face. The watch case is super thin, at 6mm. It fits my wrist perfectly. I find most watches far too bulky for my tiny wrist. Along with my watch, I also got the silver cuff! It was delicate and simple. I think it's beautiful. It has a circumference of 155mm(for the small.) 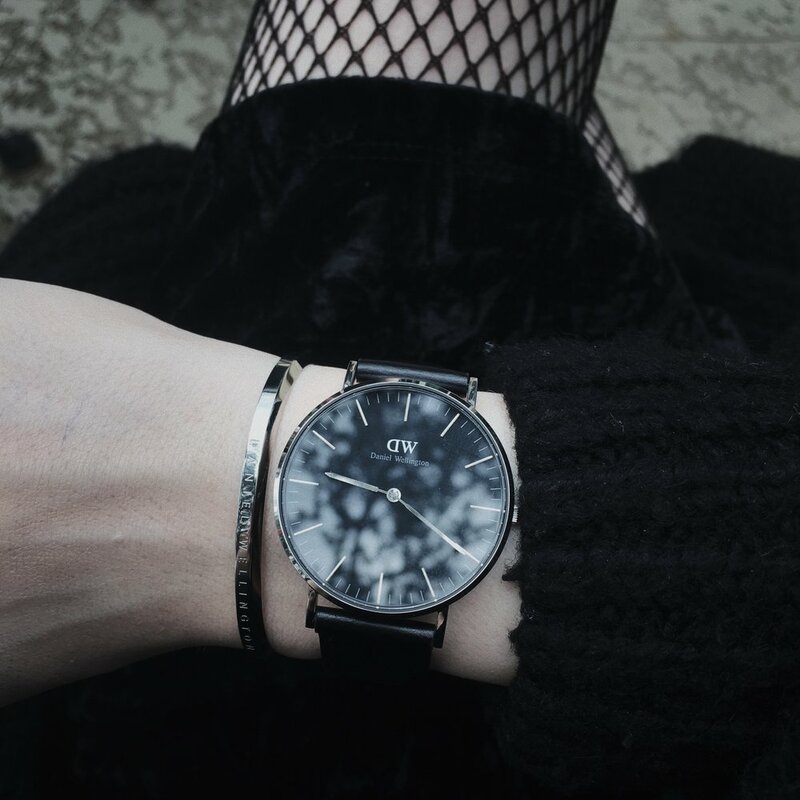 It makes a beautiful accessory to the watch and is also lovely on it's own. It's made of refined and polished 316L stainless steel. One last bit of info before I stop writing! The Classic black collection is offered with gold and silver hardware and multiple band options -- leather, texture leather, and NATO in black, brown, and dark brown. ***To maintain transparency, I want to let you know that this blog post is not sponsored. My opinions are my own and are truthful. The watch and cuff were graciously gifted to me from the Daniel Wellington team. The discount code I have is not an affiliate code, so I do not make a percentage on sales.